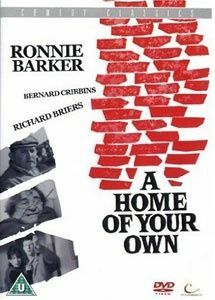 Plot A Home of Your Own is a 1964 British comedy film which is a brick-by-brick account of the building a young coupleï¿½s dream house. From the day when the site is first selected, to the day ï¿½ several years and children later ï¿½ when the couple finally move in, the story is a noisy but wordless comedy of errors as the incompetent labourers struggle to complete the house. It may well have been inspired by the success of Bernard Cribbins' classic song of the same vein from two years earlier, 'Right Said Fred'. In this satirical look at British builders, many cups of tea are made, windows are broken and the same section of road is dug up over and over again by the water board, the electricity board and the gas board. Ronnie Barkerï¿½s put-upon cement mixer, Peter Butterworthï¿½s short-sighted carpenter and Bernard Cribbinsï¿½ hapless stonemason all contribute to the ensuing chaos.